As the man tasked with giving new life to magazines on new platforms for Condé Nast, Scott Dadich says there are some things, old-school things, that don’t change whether you’re dealing with print or tablets. The magazine cover may be ascendant once again thanks in part to the debut of Apple’s Newsstand for iPad and iPhone. Combined with Apple’s subscription policy, the Newsstand could potentially be the bridge to the wider adoption of magazines on the iPad that publishers have been hoping for. “To have a dedicated container on a tablet device, the iPad, where covers are the primary means of purchase and browsing is something we’ve been looking for for a long time,” Dadich told me. But the future still remains imperfect for publishers, some reluctant to give Apple its 30-percent cut, others wanting to get their hands on precious customer data without interference from Apple. Condé Nast is already onboard with Apple, though, with more than 30 apps and almost 10 magazine editions on the iPad and digital subscriptions available for the big titles. Dadich is a true believer in tablets: He lead the team responsible for Wired’s first iPad app. Still, he hedges that idealism with heavy doses of pragmatism. In an interview that covered everything from publishers’ relationship with Apple to developing a new design guide for the tablet, Dadich outlined a future that will find magazines thriving again. “It’s not that far-fetched to imagine 20 to 25 percent of magazines’ readership existing in a digital platform three to four years from now,” he said. Partnering with Apple is a necessary element of experimentation right now, Dadich said. Instead of getting hung up on debates over divvying up revenue and ownership of data, companies could be spending that time trying to reinvent themselves. Besides, as Dadich sees it, media companies have always had to make friends in order to deliver their products on time. Apple’s just the next step in that. Apple, he said, offers a new kind of delivery and distribution chain, one that could eventually cost publishers less than the analog model of printing press/delivery truck/mail box/newsstand. And the benefits extend to consumers, he pointed out: With Newsstand, in the same way you can be confident that your copy of GQ will arrive in the mail the second Monday of the month, iPad editions deliver content on time, every time. Instead of having to rush to download the latest New Yorker before a flight, it’ll just be there. Which is where the design element comes in. As we already know, taking one form of media (newspapers and magazines) and trying to graft it wholesale onto another (the Internet, mobile devices, tablets) doesn’t generally work. But even within magazines, there’s no one right answer. While Dadich and the team at Wired were lauded for their success with launching Wired’s app, the same principles wouldn’t apply to, let’s say, The New Yorker. Different publications, different design needs. For a company like Condé Nast, differentiating its titles on tablets is as much about the brand as it is about the reader — which is why Dadich relies on something he calls the “design fidelity spectrum,” a concept that slides from rigid faithfulness to the original product on one end to a completely new and unique look on the other. Most newspaper and magazine websites, and to an extent mobile apps, have little in common with their print counterparts. Conversely, The New Yorker and GQ, even with the addition of audio, video, and animation, still track fairly closely to their origins. Finding the right spot for your title, and determining how it meets up with your readers’ needs, is the big question, Dadich said. Because media apps now compete not only with each other, but also with aggregation, reading, or social news apps, Dadich said it’s become more important to experiment with the way you package your content. While the iPad offers the opportunity for magazines to recreate an immersive, intimate reading experience, the iPhone can offer a different scale of opportunities, he said. “The completeness of an entire issue isn’t the attraction on the phone, but the service-oriented content is,” he said. Photo by Christine Navin, originally shot for Print magazine. Image by John Federico used under a Creative Commons license. Ellis, Justin. 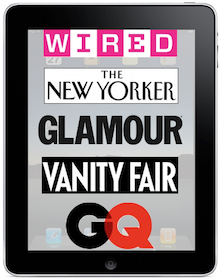 "Condé Nast’s Scott Dadich on reinventing mags for the iPad and why partnering with Apple matters." Nieman Journalism Lab. Nieman Foundation for Journalism at Harvard, 5 Jul. 2011. Web. 19 Apr. 2019. Ellis, Justin. 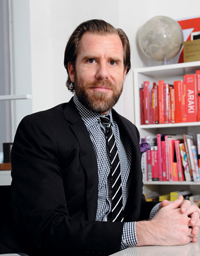 "Condé Nast’s Scott Dadich on reinventing mags for the iPad and why partnering with Apple matters." Nieman Journalism Lab. Last modified July 5, 2011. Accessed April 19, 2019. https://www.niemanlab.org/2011/07/conde-nasts-scott-dadich-on-reinventing-mags-for-the-ipad-and-why-partnering-with-apple-matters/.